McMinnville, Oregon, 61 years ago. Little did Evelyn and Paul Trent know what they were starting when they spotted a metallic disc-shaped object near their farm. At 7:30 pm on Thursday, 11 May 1950, Evelyn saw a disc hovering in the sky and ran into the house, yelling for Paul to grab a camera. Paul managed to snap two photographs before the disc moved off to the northeast. News of this unusual sighting quickly spread around the world. Paul’s photos went out on the wire services; an article featured in Life magazine; and the event sparked a nation wide surge of interest in UFOs, hot on the heels of the Roswell incident and Kenneth Arnold’s sightings at Mt. Rainier, in 1947. Even today, Paul’s photos stand up to close scrutiny and remain unchallenged and still remains a mystery — they didn’t have Photoshop back in those days. Bruce Maccabee spent two years analyzing the Trent negatives and ultimately determined they had not been altered nor did they depict any kind of attempt to stage a flying saucer. Every May since 1999, thousands of people have flocked to the picturesque town of McMinnville to celebrate and honor the Trent’s historic UFO sighting and attend the annual McMinnville UFO Festival. And a festival it is, with a stunning variety of events ranging from the sublime to the ridiculous. It’s the second largest annual UFO festival or gathering in the U.S. for aficionados and the just plain curious, after the annual Roswell, New Mexico, 5-day UFO bash. Tim Hills, senior historian for McMenamins Hotels describes how he came to found the event. The company was renovating an old downtown hotel and, “While at the Yamhill County Historical Society perusing its vertical files on McMinnville, I came across a copy of the front page of the McMinnville Telephone Register of June 8, 1950, featuring the two photos shot by Paul Trent. I never knew of the photos or sighting, but started researching the case. I talked with several longtime residents who shared details and context about the Trent sighting and photos. As the story began to unfold for me, I realized the 50th anniversary of the case was approaching and thought I couldn’t let it pass without some kind of ceremony or program”. Hills got in touch with Maccabee and asked him to speak at the 50th anniversary commemoration to be held at the newly opened Hotel Oregon. “So, on May 11, 2000, with Bruce on hand, we held what I thought would be a one-off event. What none of us at McMenamins realized, especially me, was that there was such great interest among a devoted portion of the public to learn about this notable Oregon case, and about UFOs in general. While most attendees were local, we heard that some came from as far as Florida, Tennessee and California. In fact, so many more people turned out that the dining overflow room where we had the event set up proved way too small. The crowd spilled out into the rest of the first floor”. “After that experience”, continues Hills, “we decided to try it again next May with different speakers. And that event drew a larger crowd, prompting the 3rd annual UFO festival. And each year, I worked on lining up speakers while an expanding number of other McMenamins employees were recruited to help with the overall event. From them came suggestions of new components to add, such as vendors of UFO related material and a costume parade. The latter is what really started drawing crowds by the hundreds, especially families with young kids”. “Having both serious and fun components at the UFO Festival was not really something we consciously planned. It evolved from the fact that we (McMenamins) have logged a lot of time with lodging, dining and special events and have a pretty good reputation for serving up fun/interesting, family fare. So, it was a natural to us to consider adding a costume parade, musical acts, an old-time radio theater production, and costume ball”, says Hills. Dedicated UFO researchers might be put off by such frivolities and the generally lighthearted atmosphere at the UFO Festival, but there’s also a serious side to the event — it’s not all capering around the streets in aluminum foil caps and Wookie costumes. Many world-renowned and respected UFOlogists including Stanton Friedman, Linda Moulton Howe, Peter Davenport, Jesse Marcel, Jr., Budd Hopkins, David Jacobs, and Kathleen Marden have expounded on various aspects of UFOlogy. 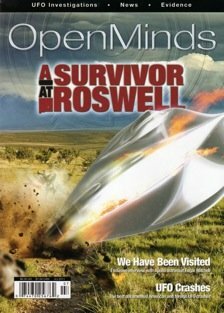 Topics have included interesting sightings, documented landings, military encounters, bizarre crop circles, government cover-ups, and yes, even “aliens-are-among-us-now” presentations. Richard Dolan has spoken about UFOs and the National Security State, the same topic as one of his recent books. “I am deeply flattered to have been called upon by the McMinnville UFO Festival, to serve as its master of ceremonies”, says Peter Davenport, Director of the National UFO Reporting Center (NUFORC) since 1994. His presentations have been about some of the more dramatic sightings reported to NUFORC over the last sixteen years. “The audiences (at McMinnville) have been quite receptive to what I’ve had to say”. He adds, “I’ve not only watched the McMinnville Parade, but I’ve been in it! I usually avoid such light-hearted aspects of ufology, but I have enjoyed the festivities surrounding the McMinnville event”. Colin Andrews, British crop circles researcher who has advised Margaret Thatcher’s cabinet, the Queen, and the MOD, describes the McMinnville UFO Festival audience as, “A very pleasurable and respectful audience but not afraid to ask hard, even skeptical, questions. They gave me a long and loud standing ovation, and I was honored and touched after the last five years of hibernation and threats and hatred from within the ranks of the crop circle research community. McMinnville was like my first breath of fresh air in a few years”. Andrews too enjoyed the Alien Parade; “It was such fun: we had not laughed so loud for a long time. It’s part of why the spirit within the presentations is so light and yet informative”. Another presenter, James Clarkson, former Washington State MUFON Director and career police sergeant, describes his audience; “If there were skeptics present, they kept to themselves. There is a sense of the overall intensity and focus in the room — a presenter’s delight”. Clarkson’s talk covered the story of his friend, June Crain, who told him about an ongoing governmental cover-up of crashes, recovery operations, secrecy and the vast difference between what is told to the public about UFOs and what is discussed by scientists and engineers in high security settings. Crain worked at Wright-Patterson AFB from 1942-1952. Eyewitnesses like Kris and Mark Bales, Travis Walton, and Betty Hill have described their dramatic abductions and traumatic encounters at the McMinnville event. The Bale’s brother’s (Kris and Marc) 2009 presentation on their sighting in remote Northern Idaho in 2000, while on an overnight hunting trip, was particularly dramatic. The four hunters were settling in for the night when they witnessed an enormous, football field size, silent triangular object hovering 200 feet above them, “close enough for me to shine a flashlight on the craft”, Kris Bales tells me. White lights pulsated around the edges of the craft and a ruby red light, 90 feet in diameter, was in the center. Shaken by the experience, the hunters rapidly left the camp and drove to the nearest town, a considerable distance away. Soon after, they filed a report with the National UFO Reporting Center, where the Bales brothers wrote; “My brother and I like to think we are normal, educated businesspeople. We have excellent eyesight. This was also a ‘dry’ camp. Although this exceeded the limits of our known comprehension we felt privileged to have witnessed this most incredible piece of equipment”. Despite the remarkable juxtaposition of the serious and not so serious, the UFO Festival has survived, indeed thrived, through careful planning. Says Tim Hills, “It quickly became clear that unless we maintained a serious, respectful presentation of the speakers, the entire event would collapse into silliness and quickly disappear. What’s happened, that’s been interesting and fun to watch, is the “cross-pollination” of the festival’s two components. That is, some people who come only to watch the parade end up checking out some of the speaker presentations. And, at the other end of the spectrum, many from the serious, scientific crowd, who come just to attend the speaker presentations, end up wandering out to see the parade and maybe hang around for the costume ball. And as a result, there’s been quite a bit of blending between the two seemingly distinct audiences, and both end up tending to learn and have some fun”. Hills tells me that they wouldn’t have been able to get some of the presenters to accept their invitations to speak “had it not been for past speakers’ assurances that the UFO festival is truly committed to treating the subject in a respectful and scholarly manner”. Still, several of the speakers have refused to have anything to do with the less serious side of things. It’s a hot day in McMinnville, and huge crowds of people are gathering in the shade of the large leafy Maples lining McMinnville’s quaint, historic streets — everyone from town and the surrounding wine country must be here today, all 32,400 of them. As I wander through the marshaling area for the alien costume parade I’m in awe at the ingenious and colorful costumes created by the excited participants, all hamming it up for the camera. Name a sci-fi/alien movie and its characters are here: grays, Wookies, Star Wars storm troopers, coneheads, cyborgs, and a bunch of aliens that are new to me. Everyone’s having a blast! The parade pours onto Third Street and the appreciative crowd applauds each and every one of the outlandishly costumed aliens. As intrigued as I am about how such light hearted events can exist so well with the more serious side of the UFO Festival, I think Tim Hills sums it up nicely. “By the end of the UFO festival, nearly every speaker has expressed to us a value he or she sees for having an event that offers both lighter fare and serious presentations: it attracts people who otherwise wouldn’t turn out for such activities, and many end up experimenting with the “other” component, something they never anticipated doing. And, in that spirit, numerous speakers have ended up participating in the parade (though not in costume)”. If you’re looking for an offbeat, lively and interesting UFO event, still with a serious side, featuring a world class who’s who of UFOlogy, the McMinnville UFO Festival delivers nicely.